The World Cup 2010 is days away and there are loads of iPhone apps for following the upcoming games. 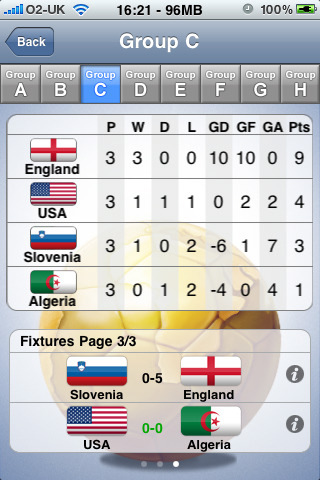 The WC Planner 2010 app is great for visually predicting your winning countries in various stages of the competition. You can also view the all participating countries on a world map and view details about each team’s players. The app will also give you results once the games have been played. There are 2 planners that help you setup your predictions in both the Group Stages and the Knockout stages. You click through A through H and tap on any fixture to enter your score using a simple number dial, and see the full form table with points, goals allowed, losses, wins, draws and more. Countries are shown with their flags for easy identification. Each match has its own details including stadium info, time and air channel, which is pretty much ESPN. The Knockout planner is unique for its visual chart format layout. You can share your predictions on Facebook and Twitter. The Fixtures section lays out a list of all the games sorted by date. Teams playing in WC 2010 are shown on a map that points to their location. Tapping on any flag brings up an information screen with personnel details including the manager, goal keepers, defenders, midfielders, and forwards. You also see some historical stats for each country for the previous 4 World Cups. Weird enough when we peeped at the Argentina squad, Lionel Messi wasn’t listed there. Hope this is only a single mistake and gets fixed soon. There is a countdown timer on the front page and once the matches begin, you can download actual results and combine them with your own predictions to plan out the later stages of the competition. Overall, WC Planner 2010 is a decent app that has some strengths such as the visual prediction tool for the upcoming World Cup. The $1.99 price is its only major drawback, considering there are other free apps like the ESPN 2010 World Cup app which is free. AppSafari review of WC Planner 2010 was written by Joe Seifi on May 21st, 2010 and categorized under App Store, News, Sports. Page viewed 5482 times, 2 so far today. Need help on using these apps? Please read the Help Page.